This title is the first in their Legends of Aviation in 3D series. Based upon their previous works, I expected to see some amazing digital recreations of the Fokker Dr.I (the subject of this title) and I wasn't disappointed. 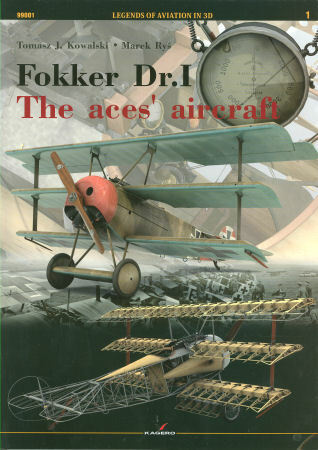 As with other titles in their other 3D series, the first portion of the title (35 pages in this case) are devoted to a nice technical and operational summary of the Fokker Dr.I during World War I. This section is illustrated with period photos and tables of vital statistics for the type. Next comes the 3D section and here is where I usually get impressed. The artist has clearly spend time with some serious engineering drawings and period photos as there is now several detailed three-dimensional models of this aircraft that are rendered in a variety of angles and close-ups that are better (in many cases) than trying to see a real aircraft in a poorly lit museum. If digital modeling is going to be a new medium, Kagero has already set the bar very high indeed. This section spans just under 100 pages. In addition to the various cutaway, scrap, and skeletal views of the aircraft, there are full-color profiles of some of the more famous Dr.Is also viewed from a variety of angles. Then there are those last nine pages. I knew something was wrong when a pair of anamorphic (red/cyan) 3D glasses dropped out of the book when it was unwrapped. Those last nine pages are real 3D images when viewed with the glasses. You need to put the glasses on, let your eyes adjust to the color shifts, then view those last nine pages in good light. You'll see the illustrations pop off the page in a view that has depth provided using the glasses. Very interesting that printing technology is more readily available to support 3D viewing. Whether you're building Hasegawa's huge 1/8 Dr.I masterpiece or a 1/72 scale kit, this title will provide you with lots of details that are hard to find in some of the other monographs that are simply illustrated with fuzzy period photos. Once again, Kagero has done a great job of bringing this aircraft into a new perspective (with or without the glasses). My sincere thanks to Kagero for this review sample!